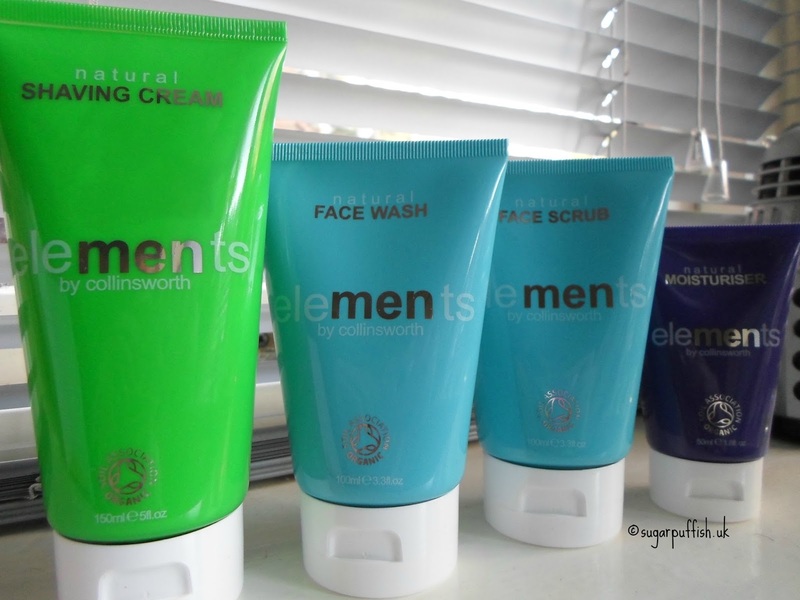 Elements* range is for men so I volunteered Mr Sugarpuffish to try his hand at reviewing and guinea pig products but I did not rule out trying them myself. It makes writing easier if I also have a feel for the products. Elements products are Cruelty free (BUAV Leaping Bunny), certified organic by the Soil Association and approved by the Vegetarian Society. The range consists of Face Wash, Face Scrub, Shaving Cream and Moisturiser. Mr Sugarpuffish and I agreed that the shaving cream was pleasant to use but we would have preferred a thicker consistency to give a bit more cushioning for the blade. I have been more than happy using on my legs but he had mixed feelings and I noticed was not reaching for it often. Face scrubs are an alien concept to my man so I have been using this on my legs. I only refrain from trying on my face because of the essential oils. I have enjoyed using the scrub. It is a cream base with jojoba grains which I found to be gentle and not overly abrasive so I did not feel I was doing any harsh damage to my skin. The moisturiser is light but contains ingredients (jojoba, pomegranate, avocado & apricot oils) which hydrate the skin. Mr Sugarpuffish has been happy using it but has not been blown away by it. The price point (£16 - £22) is higher than I normally pay for men's skincare (yes, I buy his products) but about average for certified organic brand. I asked Mr Sugarpuffish for his final thoughts and he was sitting on the fence, he experienced some sensitivity which means he has been reluctant to give up his existing products for Elements. I would advise caution in using these products if you have very sensitive skin as there are a number of fragrance allergens due to the essential oils. I do think natural and organic men’s skincare is an overlooked area of the market so Elements does not have much competition. I am happy to recommend that you check out this brand. Mr Sugarpuffish may have been unsure but I have nice smooth legs so that must count for something. I have never heard of this brand before so thanks for sharing this review!